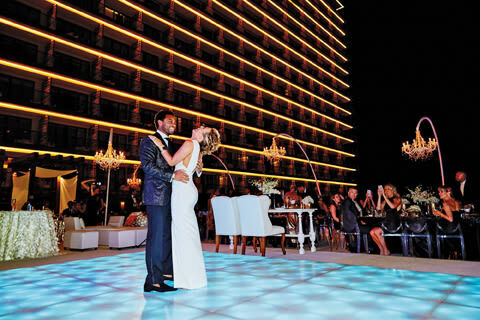 With sunshine in mind, a Portland pair hit Mexico for their February 2015 nuptials. Here, they share tips to help you pull off destination I do's beautifully, too. Scroll down to see more photos of their big day. The couple: Shannon Ponciano, owner of Ponciano Design, and Brandon Gill, a real estate broker and developer. They wed February 27, 2016, at Secrets The Vine Cancun. It was a “modern classic glam” gala and dream vacation, with 78 of their favorite people along for the ride. How can couples make their planning-from-afar process as sane as possible? If you’re able to, definitely visit your venue beforehand so you can check out the atmosphere and service, and try the food yourself. Your wedding is an extension of you—even if it’s far from home, you want the experience to reflect your personalities and taste. It’s also crucial to hire an on-site wedding planner! Ours (Yamina Bermudez) helped us locate all the items on my “vision board,” from gold flatware to freestanding chandeliers and much more. She also helped coordinate our menu selections, music, an incredible MC, and the schedule. But our most essential advice is to make selections within your budget and plan as best you can—and then let go of any expectations. You can’t control certain things like the weather or surprise day-of setbacks, but you can have peace of mind that you did your best. Did you have any special extras for your guests? Everyone arrived to a welcome canvas tote filled with gold party glasses, a hangover kit, and the overall itinerary. We also chartered a catamaran that took us all to a private island for a gourmet Mexican buffet (with margaritas! ), swimming, and, of course, a dance party on the beach. It was really quality time with loved ones who traveled to celebrate with us—doesn’t get better than that! How about some quality just-the-two-of-you time? Our alone time was actually very meal-driven: we would start our day together with breakfast and end it with late-night room service. At the wedding, we made sure to have a “sweetheart table” for just us. It was great to have that moment together, enjoying our dinner and taking it all in. Shannon: After a coast-to-coast search for “the dress,” I decided on a beautiful Tulle New York gown from Divine Designs, a couture bridal salon in Portland. After the ceremony I switched to a Solace London party dress, mostly to show off my incredible Jimmy Choos! I packed the dresses in a garment bag to carry on the plane, and then had them professionally pressed on the wedding day. Brandon: I wanted something sleek and high-end that complemented my personality and fit me perfectly. With fantastic customer service, Michael Allen’s Clothier is by far the best place to get a custom-tailored suit. Mine was a slim-cut black pant with a black-and-gold metallic shawl-collar jacket. Any other key things you packed? If possible, arrive a few days before your guests so you can acclimate, meet with vendors, and just relax. It’s nice to feel refreshed and ready as people start to arrive, so you can soak up every moment!